What better way to make the best of the snow than to get out and enjoy some winter activities? For most people this is a great idea, but for those with vestibular disorders it can present some unexpected challenges. The vestibular system includes the parts of the inner ears that sense head position and movement, and the parts of the brain that process this information. The brain weighs what the inner ears are sensing against information from vision and from proprioception (which is the feedback from position sensors in our muscles and joints). The brain uses these three sources of information to figure out where you are in space, and generally we need accurate information from 2 out of 3 in order to feel oriented. However, if the information from the inner ear(s) is not quite right, or the part of the brain that has to accurately process the ear information has a problem, then the brain is no longer sure what your position in space is. Now we’re down to 2 out of 3 systems providing reliable information, so if there is a conflict or challenge to either of those two remaining systems (vision and proprioception), you can start to feel disoriented, unsteady, dizzy, nauseated, anxious, etc. So what does this have to do with winter sports? 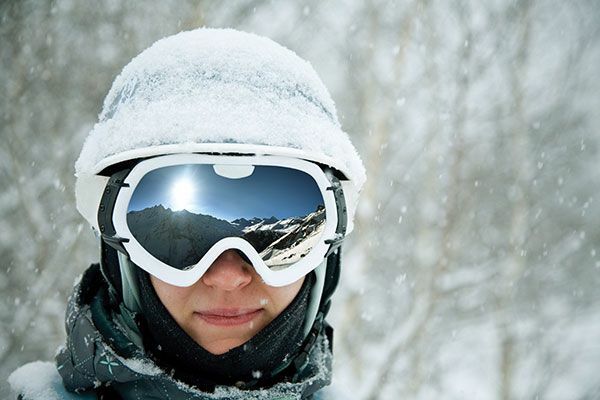 Winter sports are filled with challenges to both vision and proprioception. Let’s start with the things that make it harder to use visual information: looking through falling snow, glare, flat light (like on the ski hill on a cloudy day), looking through ski goggles, or where there is a lack of visual reference for horizontal such as when you are on a hillside. Things that make it harder to use our proprioceptive information include standing on sloped or uneven ground, being on soft or slippery surfaces like snow and ice, moving surfaces like skis/boards/skates or when the snow gives way a little under your boots or snowshoes, or even if your feet are losing some sensation due to tight boots or the cold the information about your base of support won’t be as accurate. People with vestibular/inner ear problems are far more dependent on receiving accurate information from vision and proprioception because they aren’t as able to turn to the vestibular information when there is a conflict or when one of the first two gets challenged. From the examples above you can see how winter sports bring into play a whole combination of visual and proprioceptive challenges that can leave those with vestibular problems perplexed at how the activity is not as fun and easy as it used to be, or maybe even not tolerated at all. Choose to get out there on days that aren’t snowing and overcast and wear sunglasses to reduce glare so that you can get the best visual cues possible. Choose flatter terrain and firmer snow conditions than you might have previously sought out. Use warm and properly fitting footwear. Take more breaks and start with a shorter outing, slowly building up your ability. Choose a different winter activity. For example, if downhill skiing/boarding is too challenging right now, maybe try cross-country skiing, or if that’s still too tough, you might enjoy snowshoeing or even just heading out armed with ice grips on your boots and poles in hand for extra stability. Even if it’s not your first choice, at least you’re out there enjoying winter and getting some exercise and fresh air! Vestibular rehabilitation is also proven to be very helpful for improving balance and reducing visual and proprioceptive dependence. For those whose vestibular problems are affecting their ability to focus clearly, vestibular rehabilitation can improve visual acuity during head motion, helping to maximize the accuracy of your visual cues. The rehabilitation techniques help the brain learn to use the remaining vestibular information to the best of its ability rather than having to rely so heavily on just vision and proprioception, and vestibular therapists can help with individualized strategies to help you with your particular winter activity challenges. Lifemark has vestibular therapists at over 110 locations across Canada ready to help you make the most out of winter! Visit https://www.lifemark.ca/services/dizziness-balance for more information about vestibular rehabilitation or to https://www.lifemark.ca/locations to find a location close to you.